Kearny Marsh Clean-Up: This Sunday! As part of National Trail Day Weekend, the N.J. Meadowlands Commission Bergen County Audubon Society, and the Northern New Jersey Cachers are sponsoring a two-hour cleanup of the Kearny Marsh. We plan to clean and trim the marsh's trail by foot and clean the marsh by canoe. All are welcome to participate. The clean-up begins at the northeast corner of the Gunnell Oval off Schuyler Avenue at 10 a.m. (directions are on meadowblog.net in the left-hand column). The NJMC is supplying trash bags and water, but bring your own weed clippers and gloves. We’ll also provide canoes, paddles and life jackets. 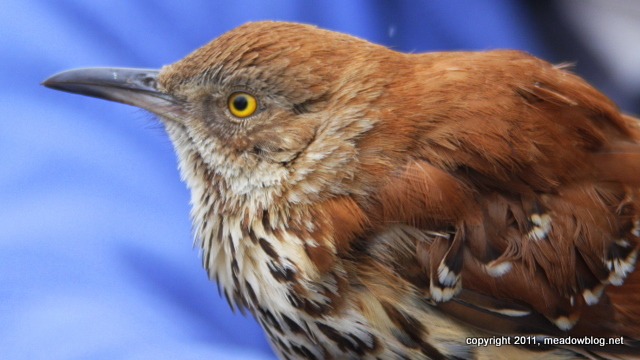 Who's this, photographed last month at the bird banding station by Harrier Meadow in North Arlington? Stephanie Seymour filed a nice report on yesterday's Harrier Meadow outing on her blog, purplechickadee.com. Link is here. The Curlew Sandpiper was a no-show at Harrier Meadow today, but we had an assortment of good shorebirds, including Dunlins, Semipalmated plovers, Least and Semipalmated Sandpipers, and Spotted Sandpipers. 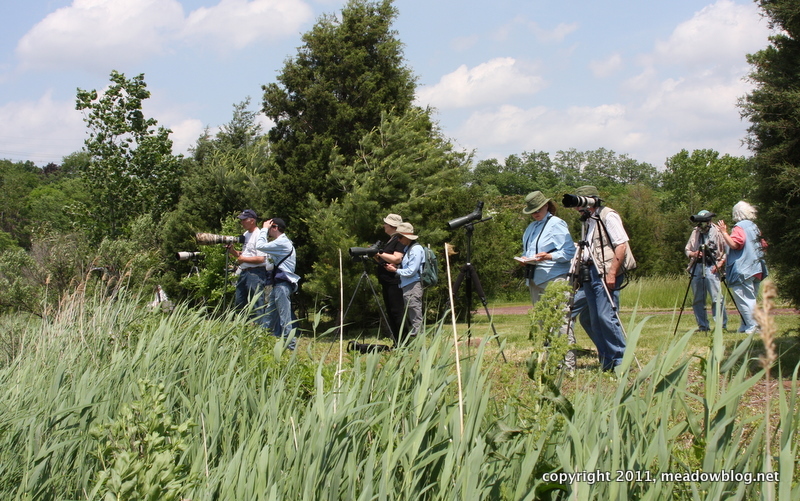 More than two dozen birders attended the last-minute walk, sponsored by the Meadowlands Commission and Bergen County Audubon Society. Harrier Meadow is usually closed to the public but was opened for this special event. Maybe the Curlew Sandpiper ought to read this blog. A big thank you to all who participated. It was a beautiful day, with a nice breeze to boot. 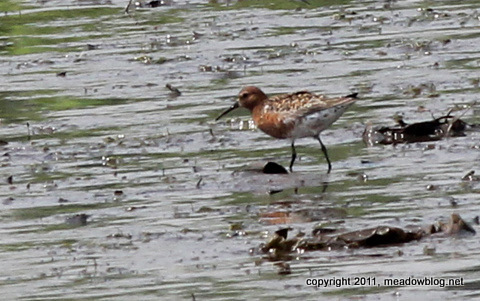 Red Knot or Curlew Sandpiper? Upon further review and more sets of eyes, we believe the Red Knot we saw in Harrier Meadow is a Curlew Sandpiper. Your input most welcome. It was seen on a mudflat by Harrier Meadow, along with Semipalmated Plovers, Dunlin, and Least and Semipalmated Sandpipers. Two White-rumped Sandpipers were seen by some in our small group. Harrier Meadow is closed to the public, but the Meadowlands Commission and Bergen County Audubon are having a special free walk at Harrier Meadow from 11:30 to 12:30 tomorrow (Saturday) if you want to see for yourself. You will need to sign a standard 2011 liability waiver, which you can download from link in left-hand column. Direcyions to Harrier Meadow are in the lefthand column as well. Bring spotting scope, bug spray, and sunblock. Jana Brusich took this shot yesterday evening on the first NJMC pontoon boat ride of the season and was nice enough to share it with the blog. She writes: " I just wanted to share with you a photo that I took last night, as I was on the Pontoon Boat ride. 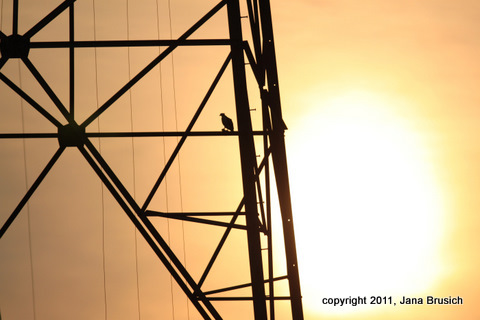 "Just before we stopped to view the Osprey nest in Kearney, we saw the silouette of an Osprey eating fish on one of the power-line towers. "There was also a Peregrine Falcon sitting one story up from him, though on the other side. I enjoyed it so much, I'll be registering again!" If you know of any place where bats are roosting in the Meadowlands, please contact the NJMC's Jim Wright at jim.wright (at) njmeadowlands.gov. 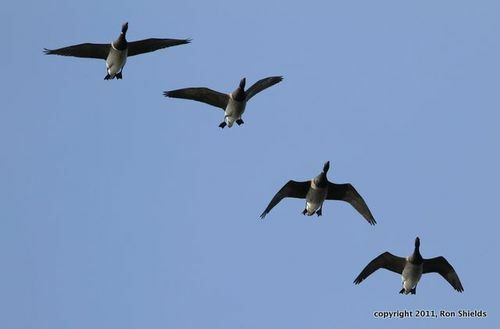 "A flock of brant at DeKorte Park photographed late Wednesday afternoon as they came, rested, and left. Meadowlands Marsh Hawk Chris Takacs and NJMC Naturalist Mike Newhouse saw a Red Knot this morning in Harrier Meadow, feeding on the nearby mudflats. This is the first recorded sighting we know of in Bergen County in 35 years. It has been seen in Hudson County, however. We are guessing it's long gone, but just in case, we will be at the entrance to Harrier Meadow at 10:30 a.m. if you are interested in taking a look. Bug spray and sunblock are always recommended. The site is usually off-limits to the public, so you will need to sign a waiver if you have not signed the general release for 2011 already. Click the button on left to download a waiver, and let Jim Wright know if you are coming by e-mailing him at jim.wright@njmeadowlands.gov. We took this shot earlier this week on a pontoon boat shakedown cruise. The shot is of the Osprey nest in Kearny by the Hackensack River swing bridge by Laurel Hill County Park. 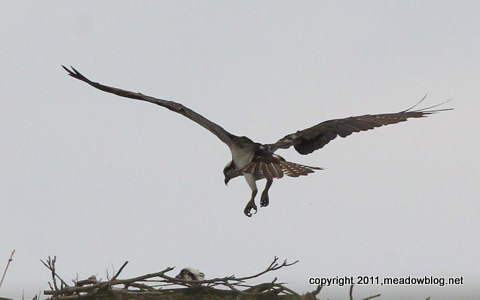 Didn't realize until we downloaded the images that one Osprey was already on the nest. This nest has been successful for a few years now. It even received an official number two summers ago: Osprey Nest #042-A-002. Links to earlier posts are here (2010), and here (2009). If anyone has any news of the Carlstadt nest, let us know.